It’s no secret that the larger economy has hit a rough patch in recent months. Although Silicon Valley has — in general — fared better than many other parts of the world, the venture capital industry is not immune to the negative effects of the macro-economic slowdown. 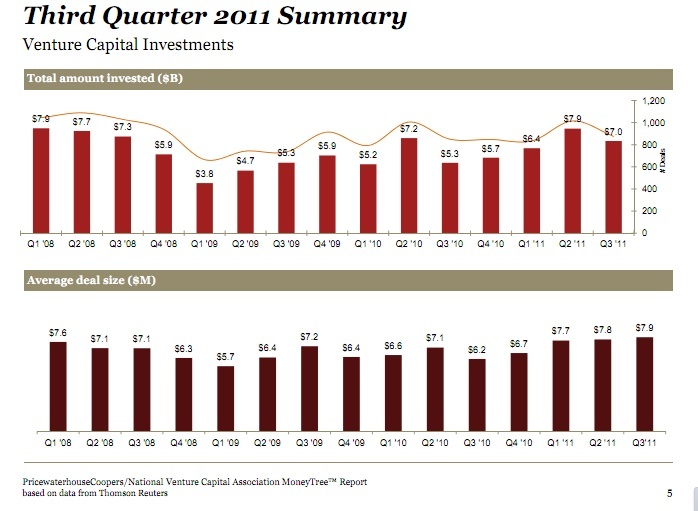 In the third quarter of 2011, venture capital investment activity fell 12 percent in terms of dollars and 14 percent in terms of deals compared to the previous quarter, according to the latest edition of the MoneyTree Report assembled by accounting giant Pricewaterhouse Coopers (PwC) and the National Venture Capital Association (NVCA).VCs invested $6.9 billion in 876 deals during the July through September timeframe in 2011, the MoneyTree report says, a notable decline from the $7.9 billion invested in 1,015 deals during the second quarter of 2011. To be fair, the industry is still up compared to last year. For the first three quarters of 2011, VCs invested $21.2 billion, which is 20 percent more than VCs invested in the first three quarters of 2010. And 2010 saw an even bigger drop between the second and third quarters of the year. But VC funding is not exactly predictable according to the time of year — in 2009, for instance, the third quarter of the year was stronger than the second. The VC industry is not as predictably cyclical as others because it generally takes its cues from a fluctuating variety of places: the worldwide economy, the entrepreneurial environment, the stock market’s appetite for IPOs, and larger companies’ appetite for acquisitions. It’s a complicated mix, but at the moment, it seems venture capitalists may be nervous about the larger environment of financial unrest, and the IPO window that opened earlier this year seems to be closing. Seed funding — which has recently been the hotshot of the industry as more angel and individual investors have become active in funding the startup scene — took a major hit in the third quarter of 2011. Seed stage investments fell a whopping 56 percent in terms of dollars quarter-over-quarter, and 41 percent year-over-year, to $179 million. 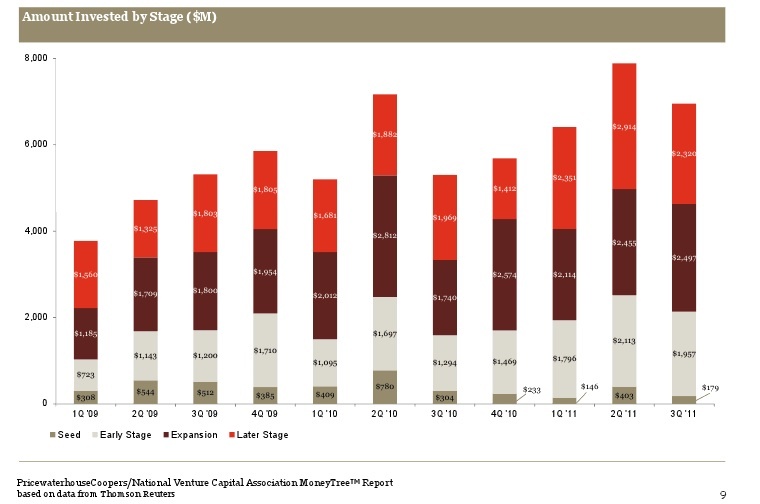 It’s not just the total amount of seed investment that’s fallen, it’s also the amount of money per deal: The average seed deal in the third quarter was worth $2 million, a 43 percent drop from the average seed deal in the second quarter of 2011, which was $3.3 million. And late stage deals have started to see major declines as well. Later stage startup investments decreased 20 percent in dollars and 30 percent in deals in the third quarter compared to the second, MoneyTree reported. Middle, or expansion, stage deals were relatively robust: Expansion stage dollars increased two percent quarter-over-quarter and 43 percent year-over-year, with $2.5 billion going into 260 deals. It’s not all doom and gloom, though. The software space has held up fairly well, receiving the highest level of funding for all industries during the third quarter with $2 billion invested from venture capitalists. That’s a 23-percent increase in dollars from the second quarter, and according to MoneyTree, the highest quarterly investment in the sector in nearly a decade, since the fourth quarter of 2001. The web industry had a relatively soft quarter, as investments in Internet-specific companies fell 33 percent quarter-over-quarter during the third quarter to $1.6 billion. But it’s not exactly time to cry for Internet startups; the third quarter had a very tough act to follow, because Internet-specific VC deals hit a 10-year high in the second quarter of 2011. Seems it’s only because Q2 was extraordinary. Aside from that, Q3 was better than all prior quarters up to Q2 08. Fire in the house? Not really.